Since mostly of the time our hosiery is sized, it is very important the final consumers select the right size when buying our socks. 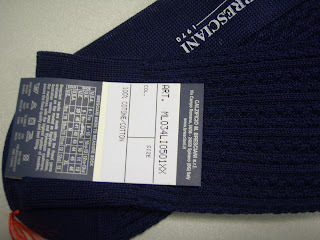 That’s why we indicated all the shoe/sock sizes on the tag. As we already mentioned on this blog, there is a big confusion on the interantional sizes, as you have American shoes’ sizes, European shoes’ sizes, European socks’ sizes and the Small/Medium/Large.. It is a kind of jungle. Sock size it is actually in iches. For example size 11 means 11 inches from the heel to the toe. It is quite strange, but only few people knows it at the moment of the purchase. On the tag you can find of course all the international information about the care of the product.